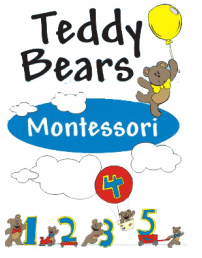 What Are Your Children Taught at Teddy Bears Montessori? Montessori is a hands-on method of teaching based on self-directed activities that allow children to learn through play. Children are given the freedom to make creative choices while acquiring education and learning new concepts. The Montessori method has been tried and tested successfully for over 100 years, and has distinct areas, as detailed below. It is in this area that the children learn life skills so that they can become as independent as possible for their age. The activities are real home-away-from-home activities. The activities and toys are child-sized, realistic and safe. They are familiar to the child and so there is a connection between home and school. Number work is an area of interest to most children. In most traditional environments, right brain learning is diminished. In the Montessori environment, we try to keep the learning of numbers exciting and fun through the auditory and tactile senses. The child then forms a solid, basic and concrete understanding and a love for numbers. The children in a Montessori School learn about the world, its origin, various geographical landforms and biomes, as well as the other inhabitants of our world. The children learn about other cultures and traditions. In this cultural area, as with all the other areas, the learning is experiential, concrete and fun. The work is always arranged from easy to difficult, simple to complex. The children learn to refine their senses in this area. The senses are the cornerstone of how they experience life, and all their senses are developed and stimulated in this area. They learn their colours, shapes and they learn to manipulate length, breadth and height. Language sets the stage for the child to grow up and develop good communication skills. The child experiences language through his tactile sense and auditory sense. This makes the learning of language fun and exciting. Learning to read becomes an exciting adventure. We also incorporate morning ring time where we discuss the Theme for the month, sing songs/ nursery rhymes.